The International Conference on the Durability of Concrete Structures (ICDCS) series brings together leading experts in the field of concrete durability from around the world. 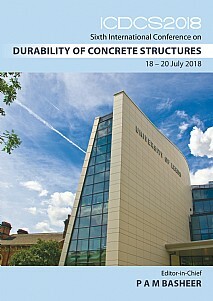 The aim is to present and discuss recent progress and latest developments in materials technology, assessment of performance both in laboratories and on site, service life concepts and reuse and recycling of construction materials and products to enable concrete construction to be durable and sustainable. This conference at the University of Leeds is the sixth in the ICDCS series. It comprises over 110 papers covering seven key themes, preceded by plenary and keynote contributions. Summary content: Plenary papers: The performance of concrete in a marine environment; Alkali-activated cements and concretes – durability testing to underpin standardisation. This volume will be a valuable tool for practising engineers, designers, contractors, researchers and advanced students in civil and structural engineering, and concrete technology. Scientists and engineers in the associated disciplines of materials science and engineering, materials chemistry and construction will find much of interest.